Download last month’s NETMA (March 2019) by clicking HERE. 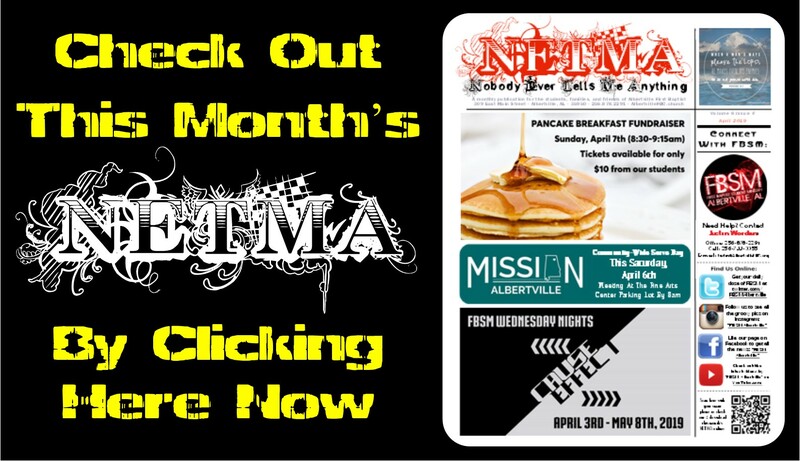 Each month we release a new issue of our NETMA Newsletter with all the info you need to be informed of what’s up with FBSM! Our NETMA includes pics of the month, our monthly calendar of events, a parents’ article from our youth guy, our Student Spotlight, and much more. To download a PDF copy of this month’s issue please click the link above. Or feel free to email Pastor Justin at justin@albertvillefbc.org to be added to our mailing list to receive your own copy each month. Thanks for following the student ministry of Albertville FBC!